This morning while I was tightening my trigger, I thought about how technical mastery is not synonymous with musical expression. As soon as this thought came to my mind, this simple song came in too! In this day of virtual communication, I know that Facebook is a popular and effective way for people to be in touch with one another. Well, Carol and some other Frequency Band people have set up a Frequency Band page on Facebook. It has videos, sound clips from the new Frequency Band "Phoenix" CD, photos and more. Carol and the gang have done a great job! Check it out by going to Facebook if you are on it or even if you're not signed up you can view a lot of the content on this page. Enjoy getting to know more about the Frequency Band and its activities and become a fan on Facebook! You also can read more about the Frequency Band on it's own page on our website. Let's face it. The lure of being in pursuit of an orchestra job is huge. Great literature by stupendous composers, an opportunity to play with fine players, conductors and soloists, and, in a lot of cases, a very good stable well-paying job or a good-enough-to-live-off-of job. Because of these opportunities, many music schools and conservatories want to be training grounds and factories that 'crank' out fine symphonic products. That is all fine, except when the focus on a rigid, formularized approach to the orchestral literature goes into hyper-drive over the basics of rhythm, pitch and sound-evenness, in place of feeling the character of the whole piece where the excerpt is a part of it. Not just a bland, understated color or texture, but a living active piece of the whole musical organism. You cannot see the spleen or colon from the outside of the body, but without them playing their parts to the fullest, you would physically be in BIG danger. That, of course, could be said of other parts in the body and it can be said for all the players in the orchestra, where the individual players are the cells and the sections become molecules and organs. A state where the player gets all tight and dull with the performance of the excerpts. It is an 'inflamed' condition and exaggerates rhythms and articulations to make sure they 'happen' and has very little real musical connection. The result can be very academic and robot-like and usually carries some contorted physical characteristics while playing the excerpts or before starting them. This is a fear of excerpts. This can, in its advanced stages, cause real anxiety in the person who suffers from it just by hearing an excerpt. It makes a person freeze up and get very nervous if they actually have to play an excerpt. If the person did not know it was an excerpt and came across the music in an etude book, they could probably play it much better, due to the lack of the mental head trip they have gotten themselves into. Some ways to prevent the 'itis' and the 'phobia' is to aways realize excerpts are pieces of a larger work and it is important to feel the surrounding music while you are playing or practicing your excerpts. Being able to play them in at least 3 different convincing ways makes it easier to not fall into deep ruts. Make sure you have your own personal musical connection to the excerpt and the piece as a whole beyond any theoretical or historical knowledge or understanding. Moving beyond Excerpt-mania usually comes with musical and emotional growth. I f you feel stuck on having a fixation on excerpts, listen to other music that doesn't have your excerpts in them and expand your musical palate and build a relationship with music independent of excerpts or orchestral music. Master Manlon and "The TAC Legend Writings"
This excerpt was inspired by a conversation I had this week with my wife, Dr. Carol Viera. Carol was talking about a "conflict" she believes people have between wanting to play in an essencely connected way and playing how they think they have to play to get a job, which they think are two different things, although "integration" is possible. Fostering this kind of integration is an important part of Carol's work with the Frequency Band and outside the FB. It is something we both feel very passionately about! Master Manlon was talking to a young musician named, Ortia, who was torn between becoming a professional symphonic ensemble player or an artistic medium of essence transfer, not realizing she could be both. Ortia: "Sometimes I feel torn between two worlds." Master Manlon: "In what way Ortia?" Ortia: "Will the training that you are giving me prepare me to get a real job in an ensemble of the symphonic kind or... will I just end up with all this incredible knowledge and not have what it takes to get employed?" Master Manlon: "I do see your predicament. To you, at this point in time, it seems like a choice between art and employment. Can a person who is training to be an artistic medium of essence transfer be employable? Does this correctly state what you are in conflict about?" Master Manlon: "You are not going to disappoint me, Ortia. I am hoping that there will be some people who can take the bold step and integrate this special training into their 'professional' life. It can be done, but I would say it certainly could be a challenge to do. But, if your own relationship with our work becomes alive in you, if you have made it your own work, then it will be integrated naturally and offer a relief and inspirational encouragement to the other musicians you are working with, as well as to all who come in contact with you." Ortia: "But the way the instructors work with us at PMMP (Professional Musicians Manufacturing Plant) puts so much emphasis on the raw mechanics that I feel like a robot who can only carry out orders or churn out notes and phrases like they were isolated pieces of a puzzle. I can't find myself in it." Master Manlon: "So after you make the processed phrase, be the fairy, like in the old classic children's story "Pinocchio." Breathe the spirit into those wooden phrases and make them come to real living life! It can be done, and has been done, and you can do it too. Try! Oh try! From the love that it should be so, try!" Fifteen minutes before the world premiere performance of "Arjuna Speaks" at the Eastern Trombone Workshop, I still was not sure what mouthpiece I am going to play. All week long I was playing on one mouthpiece that I had been playing on for a couple of months. I had rehearsed with the Army Band all week using this mouthpiece. But, for the prior couple of nights, I had only slept three hours and was tired before we even got to Washington D.C. But throughout all of this, Carol and I were tuning and fine tuning to the reasons why were at ETW. We knew why, and wanted to stay in tune with those reasons and core foundations. Other decisions would have to follow that. So, my mind and spirit were ready, my body was very 'up,' but tired at the same time. Not totally ideal for my trombone playing. But, I was not there just to play my horn in this world premiere. It was to communicate, as best as I could in this medium, what, to me, is the meaning of the first two chapters of the Bhagavad Gita--a story which I believe is about all people and their struggles, no matter what one's religious or non-religious beliefs are. This powerful Hindu text was the inspiration for "Arjuna Speaks." Arjuna is the young devotee of Lord Krishna who is caught in a serious conflict which he then, through the divine help of Lord Krishna, finds his way through to enlightenment. It is all about the timeless battle of 'good versus evil' and the various choices we make in our lives as well as how we handle what comes at us in life. This text brings to light, in its own unique way, all the different things that keep us from our true Self, and the personal battle that has to be fought if we want to keep developing ourselves towards our essential natural path, which is unique to each individual life. As Carol and I were in the small practice room tuning to the reasons why we were there and what it was I wanted to communicate that night, I decided to go with the mouthpiece I had not used in almost two years. I NEVER would have thought that I would switch equipment at the last minute like this. But life can have a way of challenging our 'logic' and pushing us in ways we never thought were possible. This incident showed me again how important it is to be open to what is needed, rather than be attached to habit or a thought process that might not be useful in every circumstance. And since I could not totally depend on my body or equipment, it forced me to connect to the core of myself, and what I believe in, even stronger, and for that I am ever grateful. With the incredible support from Carol and all the Frequency Band members, it was a deeply moving experience for me and, from the many responses I have been receiving, for others too. For me, it was an experience where I did not feel like a soloist but instead felt connected to my own 'Arjuna,' blowing the conch shell that says, first and foremost to me, "Stand up and count yourself in!" 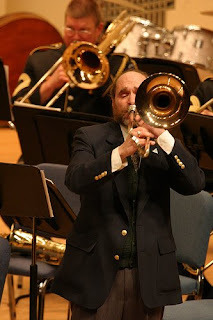 I wrote "Arjuna Speaks," for solo trombone and wind ensemble, knowing it would be world premiered at Eastern Trombone Workshop with the U.S. Army Band "Pershiing's Own." My sincere thanks to them and to their conductor, Col. Rontondi, for their sincere efforts to "be with me in it." It made a difference! Photo courtesy of Sam Woodhead and the U.S. Army Band "Pershing's Own." PMMPMaster Manlon and "The TAC Legend Writings"